Willing to support The Syrian Petition shows that you are a great person. As supporter/supporter committee you agree to the following rules of conduct and disclaimer. You agree that any action you take to support The Syrian Petition will be at your own sole risk. 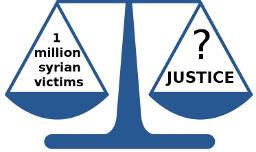 In no event shall The Syrian Petition or its affiliates, agents, officers, directors, or employees be liable to you, in contract, tort, or otherwise, for any damages of any kind arising out of your access to the Site and its Content, including but not limited to damages arising from your actions in support of The Syrian Petition. The Syrian Petition makes no warranties or representations about the accuracy or completeness of the Site Content and assumes no liability or responsibility for any (1) errors, mistakes, or inaccuracies in Site Content; (2) personal injury or property damage, of any nature whatsoever, resulting from your access to, use of, or reliance on the Site and/or Site Content and your actions undertaken in support of The Syrian Petition. The Syrian Petition can not be held liable for any breaches of this agreement by the supporter or the support committee. Although most changes are likely to be minor, The Syrian Petition may change its Supporter/Supporter Committee Agreement from time to time, and in it’s sole discretion. The Syrian Petition encourages visitors to frequently check this page for any changes to its Supporter/Supporter Committee Agreement. Your continued use of this site and any actions undertaken after any change in this Supporter/Supporter Committee Agreement will constitute your acceptance of such change.